Edward Sylvester Nolan was born November 7, 1957 in Ontario, Canada (possibly the town of Trenton) and grew up in Paterson. Eddie was part of an active baseball scene in Paterson, which drew talent from the city’s many factories. He was a running-mate of future Hall of Famer King Kelly and Jim McCormick, who is considered to be the best pitcher not in the Hall of Fame. Eddie stood 5’8” and had a muscular build. He could hurl a baseball with tremendous force, whipping the ball underhand, as the rules of the day dictated. Eddie signed a professional contract with the Columbus Buckeyes at the age of 17 and was their best pitcher at 18, in 1876. In 1877, he signed to play with the Indianapolis Blues, who were members of the League Alliance. The Alliance was a loose group of minor league clubs with a talent level perhaps a notch below the International Association and National League, which had just completed its first season. In a March exhibition game in New Orleans, Eddie pitched six hitless innings without the opposing team managing as much as a foul ball. It was a sign of things to come. Eddie’s 1877 season was nothing short of epic. He pitched in 76 complete games and went 64–4 with 8 ties—racking up the most wins ever in organized professional baseball. Of those 64 victories, 30 came by shutout—including two against the Syracuse Stars on the same day. He allowed 38 earned runs (131 runs in all) with an ERA for the year was 0.50. As was the custom of the day, Eddie earned the title of “The Only” Nolan—reserved for public figures who outshone all others with the same name. His boyhood friend, Mike Kelly, would be known alternatively as “King”·Kelly and “The Only” Kelly. The Blues were invited to join the NL in 1878. By then, however, Eddie’s arm was shot. He went 13–22 for a poor-hitting team that finished in fifth pace and went out of business owing its players money at the end of the year. Eddie headed west and played for the San Francisco Knickerbockers in 1879 and 1880. He returned to the NL with Cleveland in 1881 and went 8–14 and pitched for Pittsburgh of the American Association in 1883 and was winless in seven decisions. 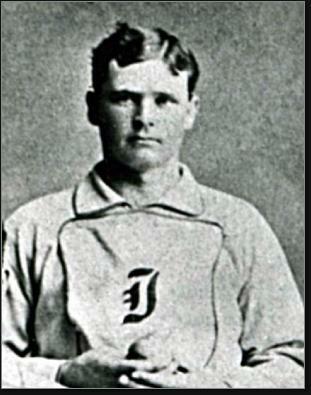 He pitched briefly in the short-lived Union Association in 1884 and for the Phillies back in the NL in 1885. His final year as a pro was 1886, his final appearance as a member of Jersey City’s Eastern League club. Done as a player at 28, Eddie returned to Paterson and joined the police force. He served for more than a quarter-century. He died in 1913, possibly as a result of a stroke or heart attack, or perhaps some internal injury, suffered during the Paterson Silk Strike.